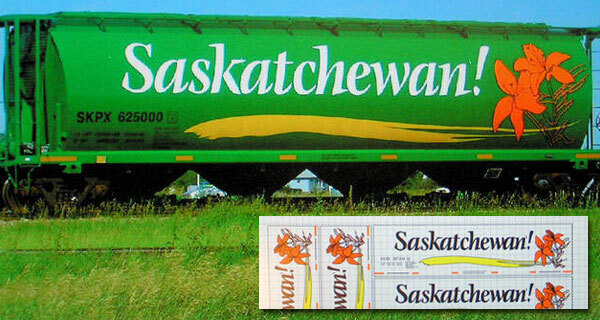 There is a new paint scheme on the Saskatchewan Grain Car Corporation 4 Bay Cylindrical Hoppers, and I read that only the HO and N Scalers were going to get them. Robert Ray realized this special project, a Saskatchewan Grain Car Corporation 4 Bay Cylindrical Hopper in Z scale. Let's follow the progress. I printed out a sheet of decals on the trusty Alps, and selected a few sacrificial 3 bay cars to mod into 4 bay cylindrical covered hoppers. The artwork took several hours, but vector art is worth the extra work, because the decals are not pixelated, rather solid spot process for richer colors. I used Kodak Spot Orange 3 passes over white, to get the flowers the right color. Fresh from the stripper, ELO took most of the paint off, so I will let the parts dry overnight. I drew up some parts for laser cutting a while back. These are good for both 4 and 6 bay mods. On the second row of pictures you can see the cut out of .030" Acrylic sign plastic. I've then sanded both sides smooth for both removal of burn oils and increased tack for superglue. Snipped off the old dump hatches with flush cutters, sanded the whole bottom flat down to the lower hopper level. This also removed about .060" of bolster, so the car will sit lower now, removed the bay welded seams with a seam scraper to hide the fact that this was a 3 bay car to start with. I've used a small thin kerf rotary saw to cut the car end floor plates off. The new ones will sit higher up, and allow the trucks to swivel, so we can lower this car .060". I've drilled out the holes in the ends of the car to .080", because I read a hobo story on the web of how they hide in these access holes on trips around Canada, shielded from snow, wind, and rain. They needed to be big enough for a guy to get inside, assembled the new car end floor plates and brake gear, and superglued into place. Now the floors are .060" higher and will not interfere with the trucks. 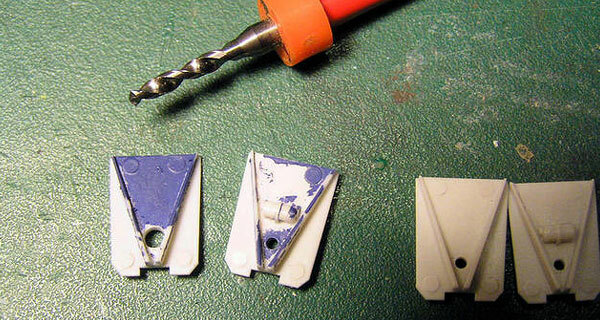 I've superglued on the square pieces that will get sanded into hopper chutes later. Set aside to dry while I goof around with a different project for a while. I laser cut some sanding discs out of 220 wet/dry, then sanded off the 6 hatches. I superglued the hatches on, using the hopper chutes as alignment guides, so they will sit directly above the chutes, and set aside to dry. Next I started forming the 4 hopper chutes by running a 1/8" Dremel Mill between the chutes.I used a combination of sanding discs, mill bit, and file, till I got the shape I was after. It only takes 5 minutes per car for this part, so it was not at all monotonous. 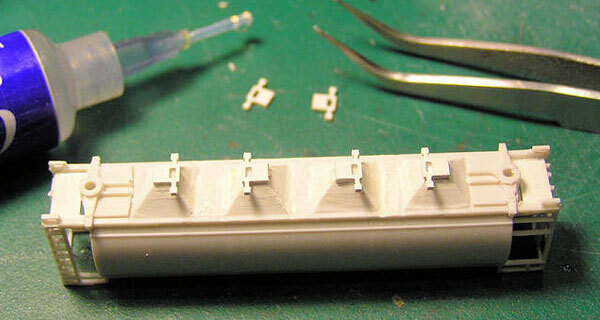 The chutes were not at all perfect, and putty is called for, so I filled in all the rough spots and set aside to dry. Coffee break time anyways! Next I superglued all the chute hatch sliders on and now it's time to research painting options. That green color will not be easy to find. Off to Hobby Town to see what I can find. Well, I admit it is a lot of work, 2 full days to do 3 cars, but I have the first ones in the world, so I am happy! See, this is the reason I like Z Scale, because whatever you do, you are the first guy in the world to do it, and there is a certain satisfaction in that! So, here is the next installment: I used Tamiya TS-35 Park Green, and shot the cars with several light layers until it was candy apple coated. I selected a couple decals from the sheet and set them on a piece of wet paper towel until the decal film was slippery enough.